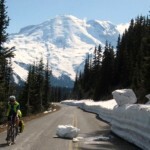 Cycling the roads in Mount Rainier National Park has grown in popularity, but riding these roads in the summer during the height of tourist season is not always pleasant. I prefer to tackle the park’s Sunrise Road early in the season, catching a narrow window of opportunity when the road has been cleared of snow but not yet open to motor vehicle traffic. 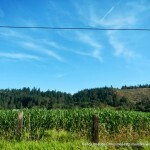 White River and Sunrise Roads: I saw many cyclists riding this route last weekend when I was up there for a hike. It’s 16 miles one-way, twisting and climbing 3000 feet to Sunrise and an in-your-face view of the mountain. There is again a narrow window of opportunity to experience this route car-free when the Park Service closes it to motorized vehicles in mid to late October prior to the winter snows. Keep in mind that road maintenance may require the closure to bikes and walkers as well, so check ahead. You can read my spring ride description for more info. Westside Road: Near the Nisqually entrance to the park, this 13-mile (one way) gravel route is open to motor vehicles for the first three miles, then becomes a hiking and mountain biking route to Klapatche Point. This road is sometimes closed due to rockfalls and washouts. Visit Rainier provides a ride description of Westside Road. Carbon River Road: Due to recurring washouts, this gravel road is open to bikers and hikers only beyond the park entrance. The route is approximately 5 miles long and ends at Ipsut Creek campsite, making it a nice choice for a short bikepacking trip, or a bike-and-hike adventure. Visit Rainier has a Carbon River bike-and-hike post. 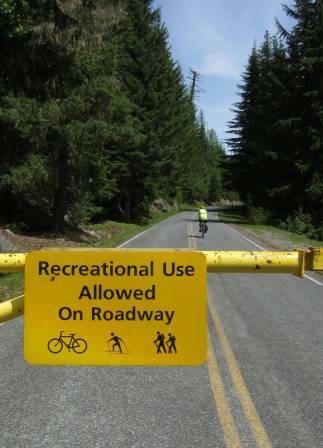 Remember, bikes are not allowed on any trails in Mount Rainier National Park. Check ahead before you go to make sure your planned destination is open, and be prepared for changing mountain weather conditions. 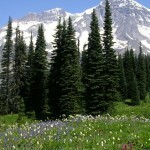 Car-Free Mount Rainier: Now’s the Time! This article was posted in Adventure, Rides, Tourism, Travel and tagged Mount Rainier. Bookmark the permalink. Follow comments with the RSS feed for this post. Both comments and trackbacks are closed.